The Golden Age (1974-1983). The age of “gonzo pulp fantasy”, or escapist adventures whose protagonists are often morally ambiguous. The chief influences are Robert Howard’s Conan, Fritz Leiber’s Fafhrd & Grey Mouser, Jack Vance, and Fletcher Pratt. The dungeon is the focus of adventure design, and the sandbox is the assumed role for a campaign setting. Larger narrative frameworks are left to the DM, and players essentially create their own stories through spontaneity. The Silver Age (1984-1989). The age of transition “that marries a sophisticated interpretation of Gygaxian naturalism with a growing concern for dramatic coherence; the construction of believable worlds and stories is its great concern; it’s also the age where the Great Wyrm begins to eat its own tail.” The chief influence here is Tracy and Laura Hickman’s Dragonlance novels. The dungeon starts to get sidelined in favor of the pre-packaged narrative with pre-determined outcomes. The Bronze Age (1990-1995). The age of the boxed campaign set, “characterized by world consumption. This age encompasses not only of the apotheosis of the gaming novel but also when such novels become the primary drivers of product development.” In other words, the evils of the Silver Age have completely taken over. The Dark Age (1996-1999). The age of decline and fall. “D&D products during this era vacillate wildly between recapitulations of works from earlier eras and bold, if often eccentric, experimentation intended to find an elixir vitae that might sustain the slowly dying beast for a few more years.” TSR dies, and the company is purchased by WotC. To put this in personal context, I was an avid D&D player between the years of 1981-1987, during the Golden and Silver Ages, and have played occasionally since then. The last game I ran was in 2005. 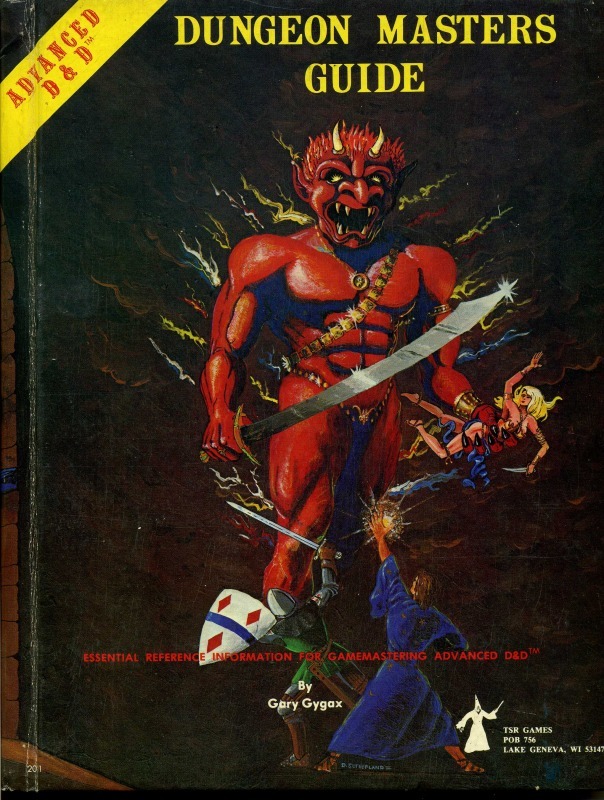 Like Maliszewski, I look back to the late ’70s and early ’80s as the unquestionable high point of D&D’s existence. When my friend and I began playing in ’81, we acquired all the terrific modules now hailed as classics, and took turns being the DM and shafting each other’s characters in scenarios like The Keep on the Borderlands, The Isle of Dread, White Plume Mountain, Expedition to the Barrier Peaks, and the ridiculously unfair Tomb of Horrors. With the advent of the Silver Age, however, adventures began following the Dragonlance model, with the result that it didn’t really feel like D&D anymore so much as acting out novels with morally pre-determined scripts. But then a curious thing happened. Just as the Dragonlance craze was picking up, and I was sensing (without really understanding) that D&D was evolving into a rather different beast, a different role-playing game was taking wing outside the context of TSR’s Dungeons and Dragons. This was ICE’s Middle-Earth Role Playing System, which included numerous gaming accessories of Tolkien’s world published throughout the period of 1982-1999. As that time period ran almost exactly parallel to the Silver, Bronze, and Dark Ages of D&D, ICE provided me and my friend with a wonderful escape route — though I doubt we saw it exactly in those terms. We just loved The Lord of the Rings (even more than the pulp fantasy novels of Leiber and Howard) and couldn’t wait to apply D&D to Middle-Earth; and once we got there, we pretty much stayed there. MERP was, after all, like most gaming systems, compatible enough with D&D; it just took a bit of preparation to work out the conversions. The end result was a bit schizophrenic, in that we continued playing pulp fantasy within an over-arching context of high fantasy. It was often claimed in these days that Tolkien’s world was inherently incompatible with the cultural and mythological backdrop of D&D, and the point must be acknowledged to an extent. And of course Gary Gygax (shame on him) despised Lord of the Rings, and only used creatures like orcs and halflings in D&D to capitalize on pop culture. 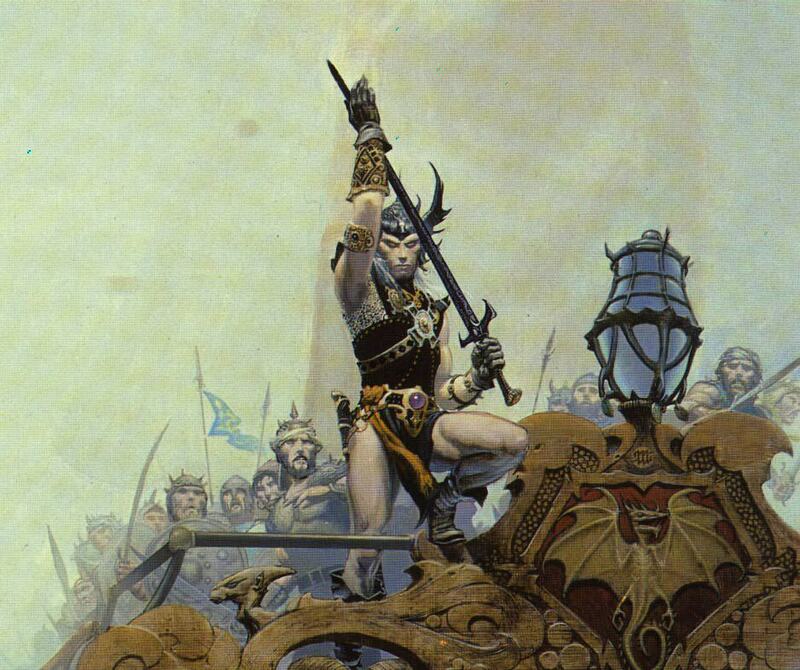 Aside from a few Middle-Earth trappings, D&D is truly steeped in the morally ambiguous pulp fantasy worlds of Conan and Fafhrd & the Grey Mouser. But with enough imagination you can make anything work, and somehow our pockets of pulp in Tolkien’s highbrow myth never seemed contradictory. Just the opposite: they breathed gritty life into a world that was a bit too “pure” for gaming. And the historical backgrounds developed in these campaign modules were truly amazing. There were endless opportunities for adventure in almost any time of the Third Age, and of course you never played out the pre-determined stories of The Hobbit and Lord of the Rings themselves. The next series of blogposts will be homages to both: a look at my favorite D&D modules put out by TSR, and then lengthier retrospectives of the Middle-Earth modules published by ICE. I never had any problems situating the former within the latter, though I’ve no doubt that poor Tolkien would be horrified at the way my friend and I bastardized his world with pulpy “amoral” adventuring. After a mid-season low point, Night Terrors is a return to form in Doctor Who, indeed a script that the old Steve Moffat could have written. Mark Gatiss hasn’t given us anything this good since The Unquiet Dead, though it plays more like The Girl in the Fireplace meets Fear Her with the latter actually done well. It’s monsters in the closet, in the vein of classic children’s storytelling — giant dolls who turn out to be an elegant and striking projection of one’s fears. The decision to set the story in a mundane urban locale is inspired, with Gatiss exploiting the minimalist setting for maximum effect. The pacing is slow and patient, a welcome reprieve after the mid-season cacophony, and Moffat would do well to recall the power of silent visuality (something he used to rely on well instead of motor-mouthing bombardments and other auditory excretions). The giant dollhouse is convincing, with perfect levels of darkness and weird touches like the clock with painted hands. Gatiss is able to use the situation to sideline Rory and Amy while still giving them enough to do, so we can take in the horrors of the house through their eyes, a narrative strategy rather reminiscent of their TARDIS entrapment in The Doctor’s Wife. As for the dolls themselves, they’re very effective, and while some critics complain about poor special effects, that’s much the point, meshing with a child’s rough, haunted perspective. Lumbering gaits and primitive facial expressions ratchet up the creepiness where CGI would be self-defeating. The only weakness, indeed that which prevents a solid rating of 4 from me, is the melodramatic climax which sees the destruction of the doll world through the father’s love and final acceptance of George. Part of me likes this, but the other part says this kind of device has been used far too often for the show’s good. And not least in Gatiss’ own previous script. The Victory of the Daleks was about a bomb-android that overrode its self-destruct program when Amy reminded it of its human feelings for a loved one. The Mark Gatiss of The Unquiet Dead wasn’t afraid to let Gwyneth simply die in her sacrifice to destroy the Gelth, and that sort of authentic tragedy is always what made Doctor Who what it was. These days the “triumph of love” theme is becoming a cheap contrivance of easy-outs (the most offensive example being from The Lodger), though I confess this story can get away with it on grounds of its premise. Bedroom nightmares easily feed into themes of childhood trauma and parental neglect, and what child underneath it all doesn’t simply crave love? A serious concern I had after the mid-season fiasco was that complex story arcs and too many plot twists were getting buried under manic dialogue and killing good storytelling. Night Terrors redresses the balance, for this is the first episode of the season completely devoid of any allusion to issues surrounding Amy’s questionable existence. Even The Curse of the Black Spot threw in a vision of Madame Kovorian at one point, but for once we get a story that doesn’t need to lean on any sensationalist crutches of “what went before”. And there is a rumor that season seven won’t have any story arcs, which would be a first for new series. If that’s true, I applaud the decision. Story arcs are fun when done well (season two’s Torchwood and season five’s crack-in-Amy’s-wall were the only ones I thought worth the energies expended), but solid, self-standing stories like Night Terrors add up to something stronger in the long run. The second of a two-parter begun in A Good Man Goes to War stands on its own feet like The Sound of Drums did after Utopia: the same players follow the plot thrust developing out of the first episode, but with everyone whisked off to a different time and setting where the drama can play out in an unexpected way. And given the disappointing non-drama of Demon’s Run, I had high hopes that things would come together at Nazi Germany. But in spite of a few entertaining moments, the problems with Let’s Kill Hitler copy those of A Good Man Goes to War almost to a tee, and can be enumerated again in a list of three. First is the appalling “payoff” of River Song, which simply isn’t. She should be evolving in an increasingly evil direction, as her timeline opposes the Doctor’s, with our Time Lord hero forced to watch the heartbreaking spectacle of his love turning more and more into someone who despises him. Instead, she goes from completely hating and trying to kill him one moment (with a remarkably ineffective poison) to loving him and saving him in the blink of an eye — and which she does by of all things relinquishing her future lives, funneling them into a regeneration that he can use. Not only is it not clear why he can’t regenerate himself (other than requiring Matt Smith to leave the show), it’s incredible that River Song would sacrifice herself this way for a man she is now coming to grips with at this point in her timeline. I’m starting to believe that Moffat never really had a plan with River Song. Everything anticipated with her character since the fourth season just happens here for no reason: she inexplicably decides that she loves this man, and in a matter of moments comes the blue diary, learning to fly the TARDIS, and (presumably) the Doctor telling her his real name (!). There’s no story here, and we’re light years away from the brilliance and tragedy that ended Silence of the Library/Forest of the Dead and promised more of the same. Second is the way Matt Smith is starting to suffer under Moffat’s penmanship. In the producer’s scripts, the Doctor is becoming little more than a motor-mouthing quip machine. There were shades of this in The Pandorica Opens/The Big Bang and The Impossible Astronaut/Day of the Moon, but now it’s getting thoroughly out of hand. Moffat has either exhausted his genius or just desperately needs us to know how clever he is, to the point where hyperactive dialogue and unwieldy plot twists obliterate character development and internal logic. But last is the title’s non-sequitur: the Hitler plot isn’t, and the grand opportunity to use him in the way Nixon was in the season opener goes entirely to waste in favor of the insanity described above. 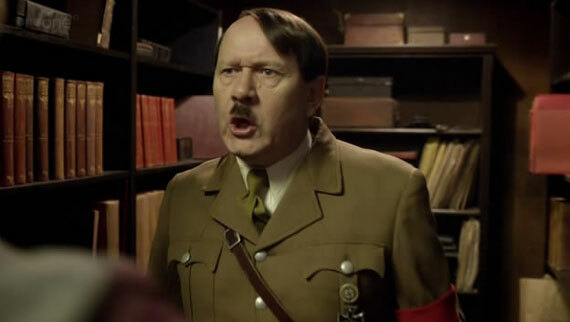 Let’s Kill Hitler is more Let’s Lock Up Hitler in the Cupboard and Forget About Him, which is exactly what happens after the TARDIS crew drops in and unwittingly saves his life (a nice touch, admittedly). In this sense, the episode thoroughly repeats the crimes of A Good Man Goes to War, which was a not-war, rather a stage for a gratuitously zany Doctor. Here, likewise, the Third Reich drama is mere window dressing, leaving woefully underdeveloped the Tesalacta — a cadre of humanoids who travel through time punishing the worst villains who escaped justice — while Amy, Rory, and River all command center attention in their awkward and unconvincing family comedy. I miss the Moffat who gave us stories, and I want him back. It looks like I made Wikio’s list of top 100 blogs in the category of film. This month I crawl in at #91. Apparently these ratings are based primarily on links from other blogs and RSS feeds. Who would have thought.